Microsoft is offering a sneak peek at its Black Friday deals for 2018. They include US$330 off the Surface Pro 6 bundled with its Type cover (in any color so long as it's black) and $310 off the Surface Pro Core M. There is also a range of XBox offers, including a Game Pass for $1 to new users. Microsoft has released details of its Black Friday 2018 campaign already. Rather unsurprisingly, it mainly features Surface tablets and laptops of varying newness. 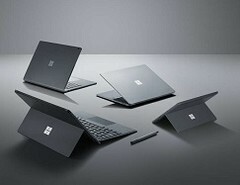 For example, the Surface laptop 2 (black version) will be available at US$300 off its usual price between November 18 and 24. Some variants of the Surface Go will also be $50 off during this period. The Surface Pro (5th Gen) with Intel Core M/Platinum Type Cover Bundle will start at $599 (or $310 off the usual price) at the same time. The Surface Pro 6 (Intel i5/256GB SSD), bundled with its Type cover (also in black only), will have a $330 discount from November 22 to 26. Microsoft is also offering deals on XBox hardware and access for Black Friday. The XBox One X 1TB will have $100 off its usual price from November 18, and select One X bundles will be cut by $50 in price. Newcomers to XBox can also get a months' Game Pass for $1, or access to Live Gold for the same price. XBox wireless controller,s will be discounted by $20 for Black Friday, although the Xbox Design Lab variants will be only $10 less. Will you be grabbing a new Microsoft product for the holiday? Let us know in the comments below!